From a wooden harlequin of Tony Blair to a glass fish and a Louis Vuitton cigar case, the weird and the wonderful are going under the hammer at an auction in Gloucester. 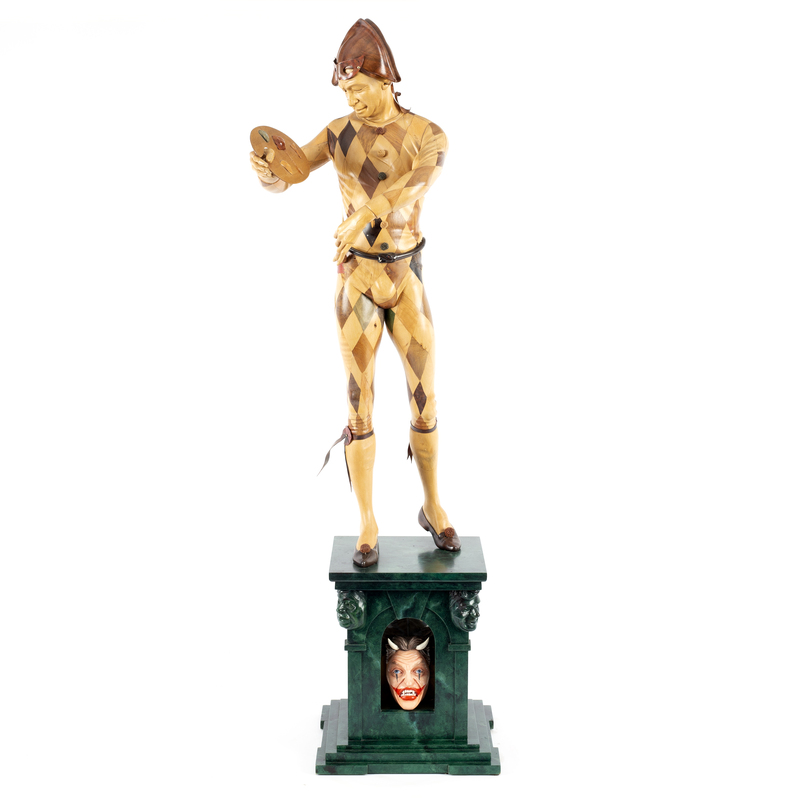 Modern art and design is hitting the auction block at Chorley’s, a Gloucester-based auction house located just a few miles from Cheltenham. The newsagents WHSmith, established in 1792, is still considered one of the best known names on the high streets of Britain. Their storefronts are instantly recognisable, thanks in large to the typography of their signage, created by artist and sculptor Eric Gill (1882-1940). 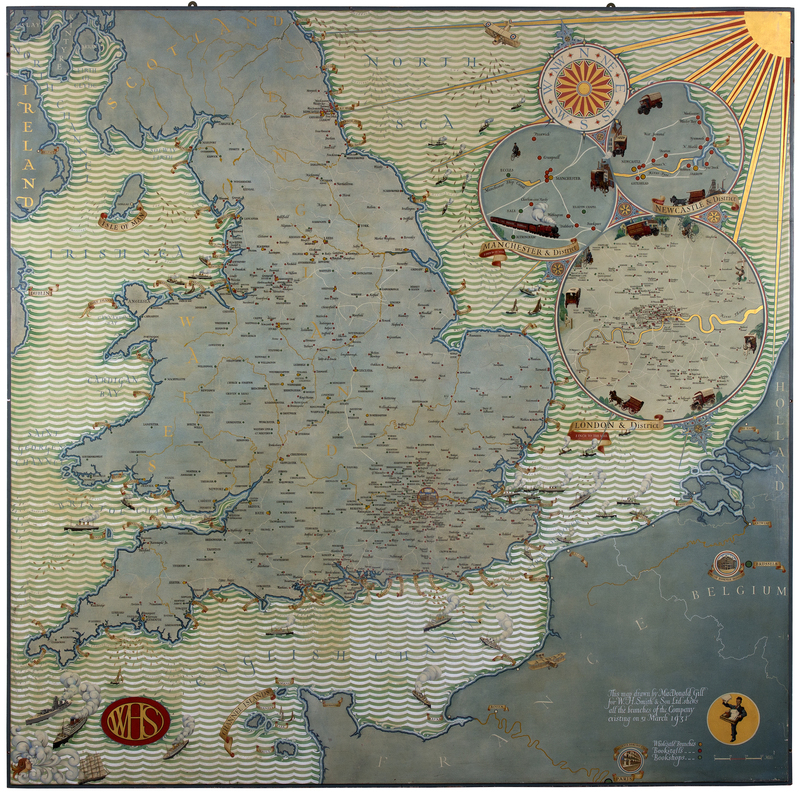 One particularly noteworthy item for sale within the WHSSmith Archive is this extraordinary scale map (1 inch to 1 mile) of Britain and Northern Europe, painted by Gill’s brother MacDonald and used for display in the boardroom of the company. The map records the location of WHSmith bookstalls, book shops and wholesale branches, and it features decorative detail from bi-planes and horse-drawn vehicles right down to the named shoals of fish in Art Deco waves off the coastline. Another highlight from the auction is this satirical wooden carving, Harlequin – The Politician by Ian Norbury, a wood sculptor whose commissions include work for Buckingham Palace and the Tower of London. 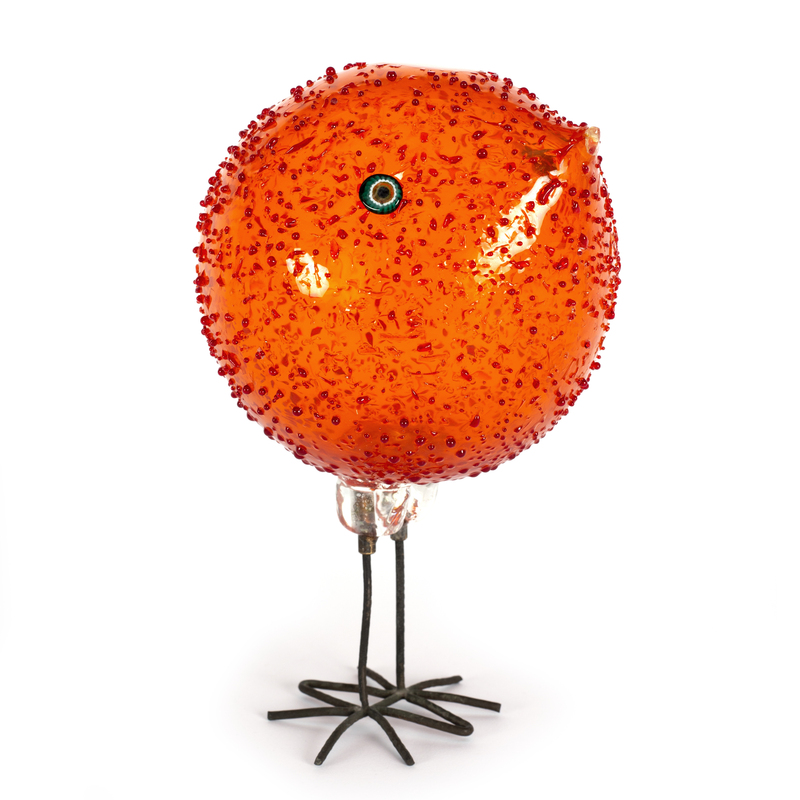 The Chorley’s sale also features numerous eye catching pieces of glass and ceramic, including this brightly-coloured glass bird designed by Alessandro Pianon (b. 1931) for Vistosi in the mid 1960s. The circular form, with spiked exterior on copper legs, measures 23 cm in height. 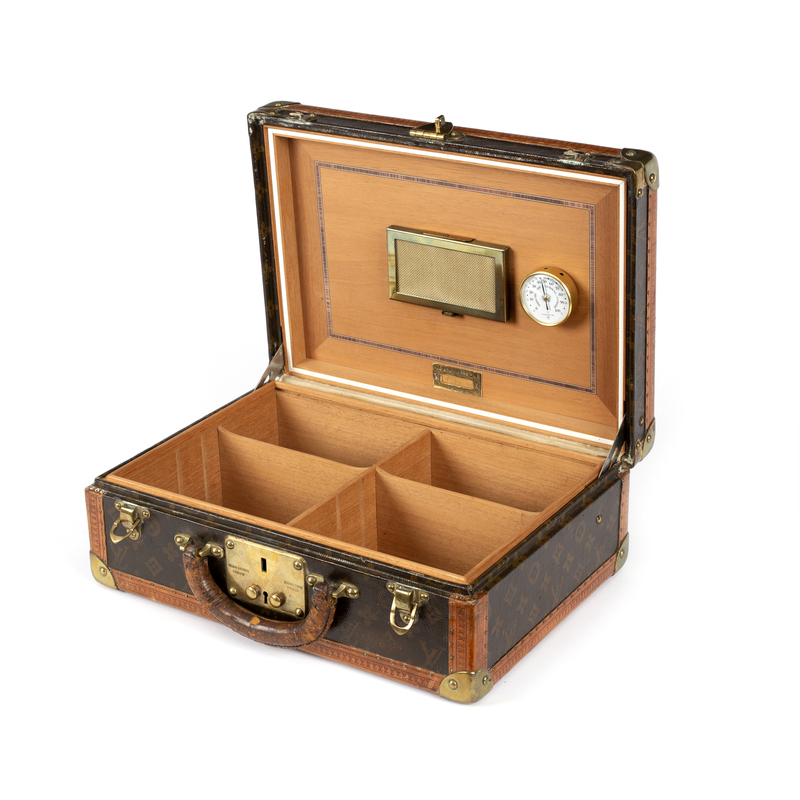 This cigar humidor in briefcase form is by Louis Vuitton, the exterior featuring the label’s signature patterned leather. Its brass mounts are stamped with LV monogram and the lock plate is further stamped with London and Paris addresses and 082946. The interior features a hygrometre and two filters and is divided into four sections. Overall, it measures 40 cm wide x 28 cm deep. These unique and high quality lots are only a small sampling of the many items up for grabs at Chorley’s. 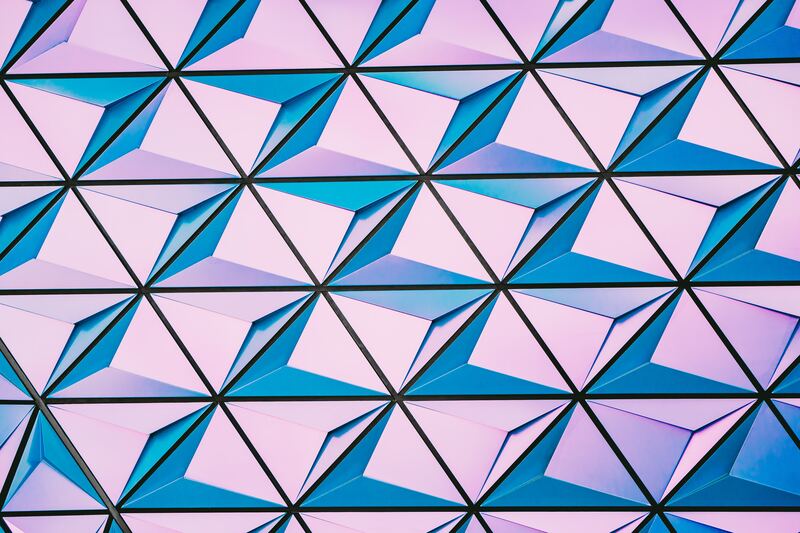 Should you wish to take advantage of all the unique and distinctive lots up for sale, we suggest you take a look at their full catalogue, where you’ll be sure to find exactly what you’re looking for.